Happy feet and the daily puddles of life ! The word dignity means different things to different people. A child probably won’t understand or be able to express it but wearing shiny black shoes to school is a universal metaphor of happiness that we are all familiar with. A fetish for shoes is common enough among people like us but what if we didn’t have any? This story is about how a pair of shoes or slippers helps many happy feet jump across the little puddles of everyday life. “Today for the first time I am experiencing slippers on my feet. My soles will not burn now on the scorching hot floor in summer. I will have to learn how to walk in these since I have never worn slippers before.” said a beaming old lady from a drought-affected tribal community in Madhya Pradesh. She had just received her first ever pair of slippers under the ‘Cloth for Work’ (CFW) initiative for her participation in digging a well in her village. She soon broke into a dance, strutting around in her new pair of slippers. Sounds surreal? In many villages and slums of India, people don’t have anything to put on their feet, yet life goes on for them. We may not even notice this every day ordeal but that’s how countless people spend their life without experiencing the comfort of a sole underneath their feet. At a high terrain border road in the state of Uttarakhand, little tarpaulin shacks on the roadside, were billowing incessantly in the chilling winds. These were the makeshift homes of labourers working barefoot on rough broken roads, repairing them after the 2013 floods. Many years have gone by but for us it is still one of the most enduring image of the tough life of migrant labourers. Their kids play around oblivious to their tiny swollen feet. The shoes we reached out to these labourers and their kids at Border Roads Organization (BRO) labour camps were perhaps the most essential items they got. This is where we started working in a more focused way with migrant labourers across the country. Shoes are now an integral part of our ‘Labour Kits’. In Madhepura district (Bihar) when a bridge (connecting Laxminia and Kahartoli villages) collapsed, the villagers got together to build it again using 160 bamboos and 10 kg of ropes. Our team decided to add shoes to their ‘Family Kits’. The sight of new shoes brought about a wave of happiness among the villagers. Outside a village school classroom, a row of new shoes neatly lined up by the children is an enduring image of hope and learning. The care and attention that each child gives to his/her pair is heartwarming and heart breaking at the same time because we commonly see broken slippers and shoes strewn all around many classrooms across the country. That’s another enduring image of what’s missing. Over the last two decades Goonj has consistently talked about shoes as an important need in village India. If we see a child walking around without shoes, it’s not necessarily by choice. Every day the kids of Silgaon Primary School in the upper parts of Uttarkashi (Uttarakhand) walked many kilometers to reach their school. Some with slippers but most barefoot, on pebbled, rough roads. When these children got a pair of shoes they yelled out loud with joy,“हमें जूता मिला है, हमें जूता मिला है” (we got shoes, we got shoes). In one stroke a new pair of shoes took away the disparity of ‘haves’ and ‘have-nots’ in their class. Next day one child wasn’t wearing his new pair of shoes. His reason, “If I’ll wear them everyday they’ll get damaged quickly. I have kept them safely for bigger (special) occasions.” Only when he was assured that he’ll get another pair when these wear off, did he start wearing them regularly to school !! This little addition to a child’s life also encourages and relieves the parent from an expense while the improvement in school attendance at many places is a big bonus. Shoes are an integral part of Goonj’s kits -be it Family Kit, Winter Kit, Labour Kit or School / Aanganwadi Kit. Considering the debris and devastation in disasters, shoes are also an indispensable part of our disaster Rahat (relief) Kits , wherever possible. Each kit meticulously packed; has both old and new pairs of shoes along with other essential items. When a family receives shoes that do not fit they exchange them with other families. 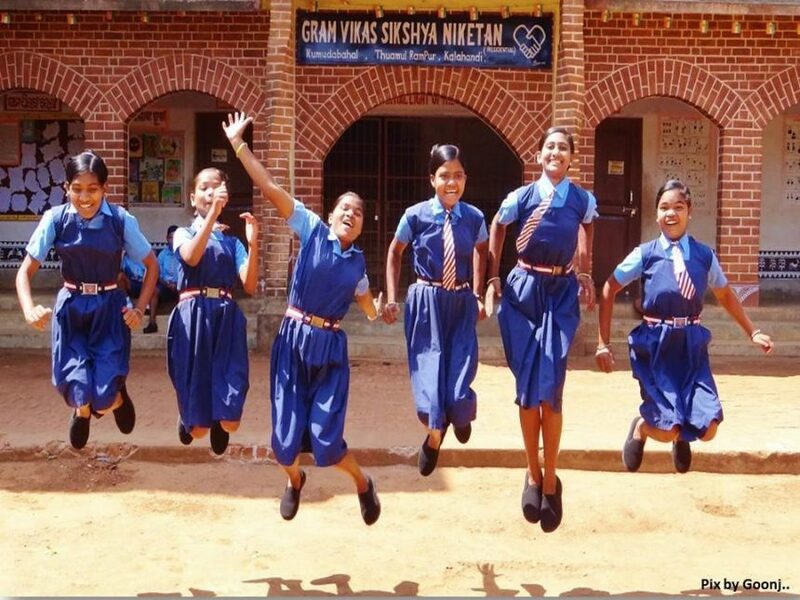 Since 2013, Goonj’s partnership with TOMS has boosted our efforts to reach shoes to rural India in a big way. TOMS is a California based company, which pledges a new pair of shoes to a child in need on its every sale. In the Financial years 2014-2017 alone, Goonj has sent out over 1 million pairs of new and old shoes in the schools, aanganwadis and directly to the communities, as a part of our Family Kits. A big part of these shoes came from TOMS but there were also thousands of shoes given by the masses.